Other than 'Kaajal' (below), the only other Ravi soundtrack I own is an e.p. - which I vaguely recall being quite good but I'm going to wait a bit before posting. (I need to find it first... after last year's move there are still loads of things that aren't where they're supposed to be). Instead, here's a compilation of songs taken from other scores of his... some quite nice, some a bit dull, most of them low key, none that I find exceptionally exciting if truth be told. A few of them were probably hits though. Wow, amazing collection. Thanks for sharing these gems. As for the songs being 'low key', I would rather categorize them melody oriented with minimal arrangements. You would have to be in certain mood to enjoy these. Anyone who likes ghazal type songs is surely gonna this album. Thank you for sharing all of this wonderful music. I love Ravi, he is one of my favorites...my favorite soundtrack from him would probably be Gumrah. His work is more melody-oriented :-) thanks. Erm... OK... You can download it, the link's at the top of this page. Is there a problem with it? You are simply awesome man! Can I expect the album "Phool aur Patthar" (1966) by Ravi please? on listening to which Naushad said ki Ravi ye song mujhe dedo aur meri saari jindagi ke songs lelo. The links for 2, 3 and 4 are still working, I've just checked. The Ravi album won't be reuploaded, sorry. 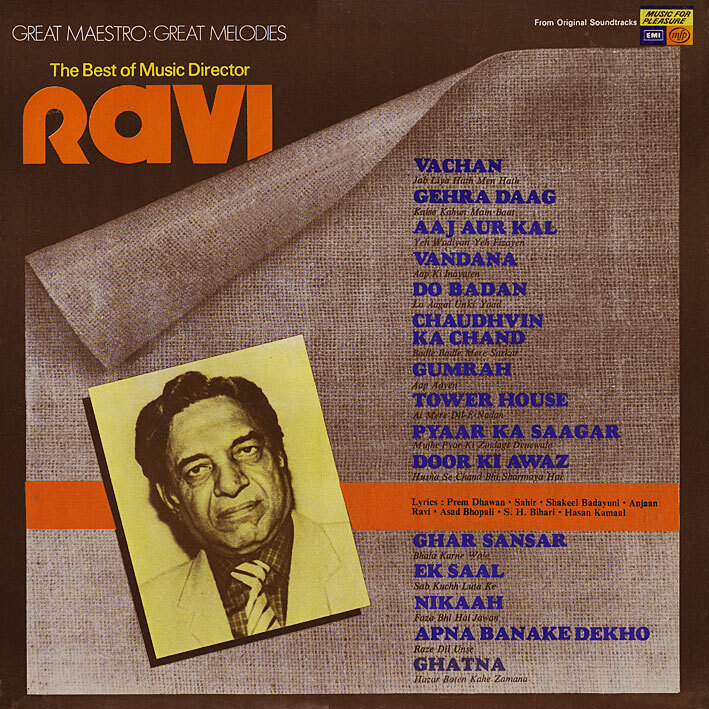 U know the gr8 MD - Ravi died a month back.. kinda made me revisit his soundtracks. I dunno how I missed this lovely compilation.. would be eternally grateful.. if u helped me out! When are the lovely forthcoming attractions coming out?